Tokyo Tokyo unveils new Store Design, Dessert Bar and New Ramen flavors. Japanese restaurant chain Tokyo Tokyo, has been a mainstay in major locations nationwide. With their constant introduction of Japanese dishes, it has been the go-to place of Filipinos craving for affordable Japanese-inspired meals. 30 years since the opening of its first branch, Tokyo Tokyo continues to remain true to its Japanese heritage by taking it a notch higher through the introduction of its latest store design which will first be unveiled in its newest branch in Venice Piazza, Mckinley Hill. The new store design maintains a modern minimalist look – medium-height wooden tables and chairs, paneled ceilings with modern low-hanging Japanese lighting accents. Walls are adorned with iconic Tokyo landmarks such as the Shibuya Crossing, temples, bullet train, tori-i and the Imperial Palace, all contributing to achieve that Japanese atmosphere. Simultaneous with the launch of the new store design, Tokyo Tokyo also introduces it first ever Dessert Bar, which features an extensive line of Japanese-inspired desserts that will surely satisfy any sweet tooth. Following the success of the Snow Ice, which was introduced last summer, customers can now choose from an expanded dessert menu. 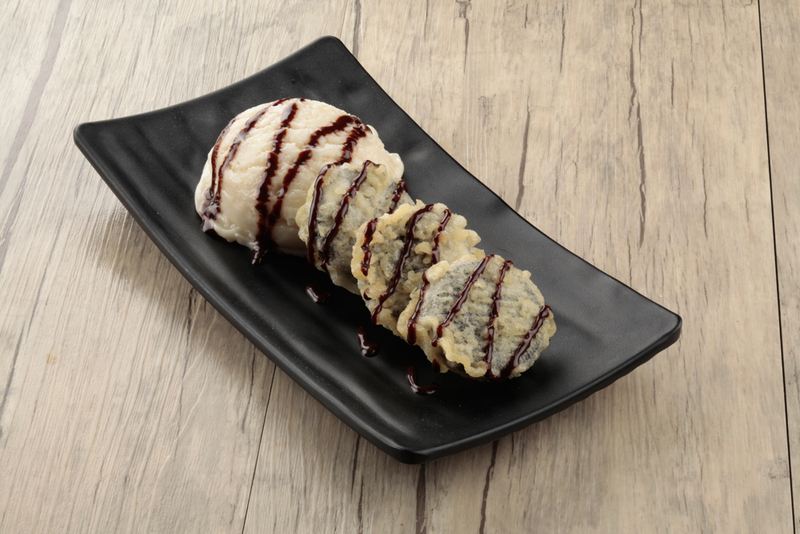 warm Tempura Oreo Ala Mode and a variety of pastries such as the flakey Croughnuts and chewy Japanese Pon de Ring. All these desserts perfectly partnered with freshly brewed Coffee preparations such as Café Latte, Capuccino and Iced Mocha, making the Tokyo Tokyo Dessert Bar menu a perfect ending to your Tokyo Tokyo lunch or an ideal afternoon treat. “We know that Filipinos love sweets and Japan has a lot of unique desserts to offer Filipinos. Expanding the options in our Dessert Bar is Tokyo Tokyo’s answer to these sweet Japanese cravings. As of now, our Dessert Bar is available in select branches, one of which is the newly-opened Venice Piazza in Mckinley Hill but expanding it to more branches is definitely in the works.” said Loresca. So what are you waiting for? Head on to the Tokyo Tokyo Venice Piazza and indulge on these new sweet treats! Tokyo Tokyo is also introducing two new additions to its ramen line with the launch of its new Specialty Ramen variants– the Spicy Pork and Chicken Teriyaki. Like the three existing ramen flavors, the Spicy Pork and Chicken Teriyaki let you enjoy this iconic and authentic Japanese snack in a whole new level. “We wanted to bring new flavors with unique but familiar tastes while maintaining the line’s value for money proposition. 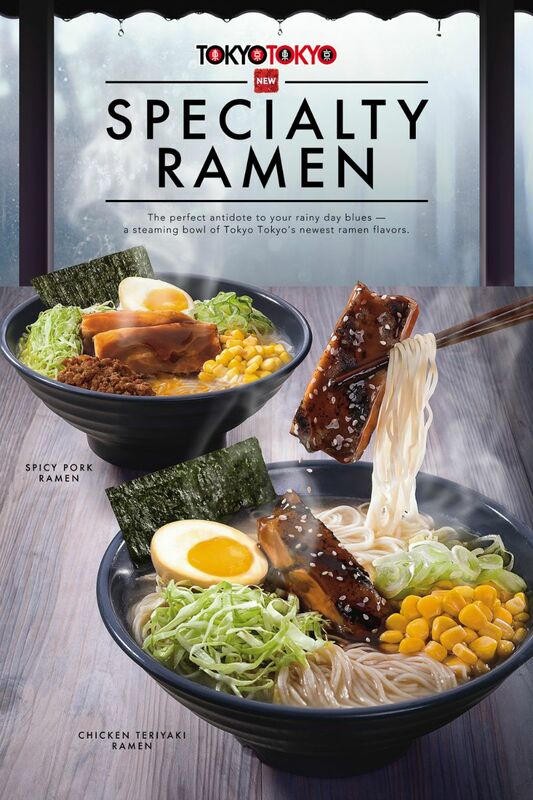 These new flavors will surely add to the Japanese ramen experience of Filipino foodies, most especially that the rainy season here,” said Tokyo Tokyo Product Manager Harvie Sering. Made with broth slow-cooked for 24 hours, freshly-made noodles, and high-quality toppings, these new ramen flavors are guaranteed to give you a slurp-worthy moment that authentic Japanese ramen gives at first sip. The Chicken Teriyaki Ramen is made with delicious grilled chicken glazed with Tokyo Tokyo’s signature teriyaki sauce, an unexpected combo of savory and sweet all in a bowl of authentic pork broth. For those who crave for something spicy, Spicy Pork is just perfect. Made more flavorful with a rich and creamy pork broth topped with spicy ground pork and tender pork slices to satisfy that craving. These new flavors also come with corn, shredded cabbage, onion leeks, and nori and egg on the side. You may also opt to pair your Ramen with Tokyo Tokyo’s Gyoza, Japanese pork dumplings which are soft, savory and chewy with a delightfully crisp underside, the perfect partner to a steaming hot bowl of Specialty Ramen. Priced at P190 for the Regular size and P140 for Snack size, these new and comforting ramen flavors are perfect to soothe your Japanese food craving – whether you are on budget or feel like trying something new. For more information, log on to tokyotokyo.ph or follow TokyoTokyoPhilippines on Facebook and Instagram. perfect for rainy season, can't wait to try it!